Well now that I'm through about a chapter and a half in all of my major classes, I'm starting to work on my outline. The reason why I wait so long to start is because my professor last year actually suggested that it's easier to start on an outline once you're a couple weeks in and have enough puzzle pieces that you can get an idea about what the finished product should look like. 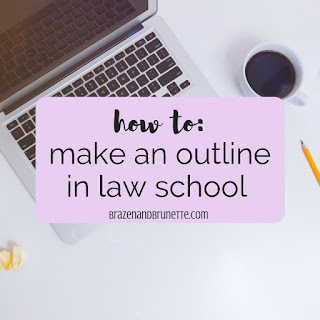 I know that how to make an outline is a really stressful thing when you first start to make one, because you've never done this before so you don't know if you're being over or under-conclusive. This is just a general guide of what I do, but I highly suggest that you schedule an appointment with your professor during office hours here in a few weeks and have your professor look over what you have in your outline so far. Since they're the ones who actually make the test, they'll be the best person to tell you what you can cut down on and what you need to beef up. If for some reason your professor isn't on board with helping you out a little, my suggestions would be to 1. ask your TA if that class has one, 2. ask an upperclassmen who took that class with the same professor before (make sure you ask what grade they got! don't want to borrow notes from a C- student), or 3. check out this website. I found these outlines last year and what's great is that they are book specific so you can make sure the information is right. I personally feel like they have WAY too much information so I don't actually study from these, but at the end of the year I do use them to see if there's anything they have on their outline that I learned in class but forgot to include in mine and then will gap fill. 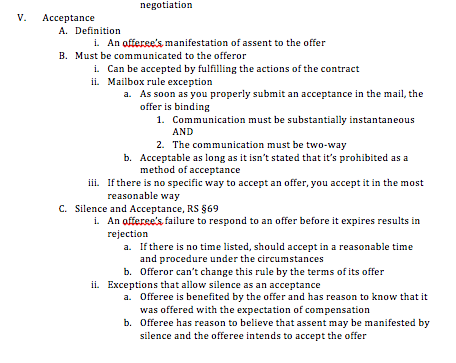 The best way I can think to show how to make an outline is to just go through an example of what I did for one Contracts case. For this example, the rule of the case (mailbox rule) was actually an exception to a rule (an acceptance must be communicated), so hopefully you can see the progression. Also, sometimes you’ll read more than one case that explains the same rule but in different ways so that you can fully understand it. Step one is to read the book which I'm guessing you've already completed so yay! 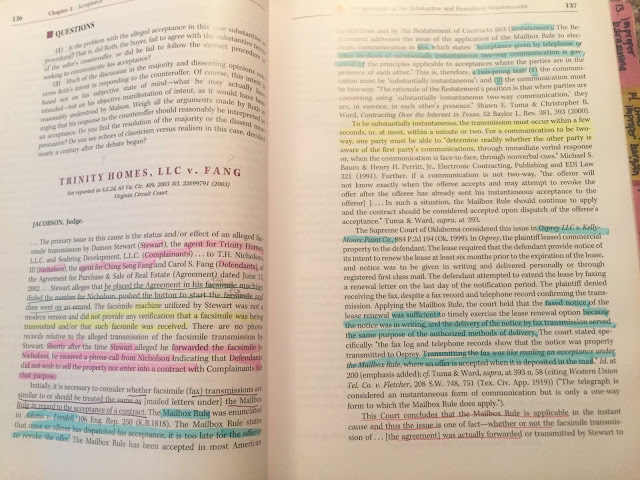 Hopefully when you're highlighting/underlining in your books, you're doing it sparingly to only get the relevant information. 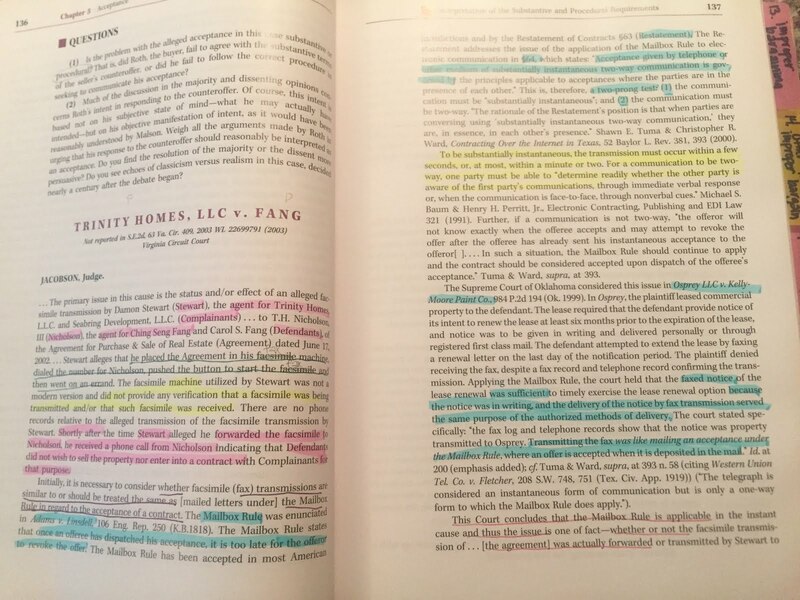 If you find yourself highlighting like five straight lines, I suggest that you be a little more picky and only highlight what is absolutely critical in each sentence. Step two (optional) is to turn what you read in your book into an IRAC. As I've mentioned before, I've stopped making briefs for each case and instead rely on my highlights as a book brief. I've also stopped the blue/black coloring in my notes because it ended up just confusing me. Step three is looking at the cases that you've been reading and seeing them as part of the big picture that is your class. What I include in my notes is 1. the rules of the cases, 2. important information in the book between the cases that I highlighted as I read, 3. info from slides the professor puts up, 4. notes I take as my professor talks. An easy way to organize your notes before you get started is to write down the headings and subheadings of your book, and then go back through and fill it in with the information as you get it from 1-4 (^^). 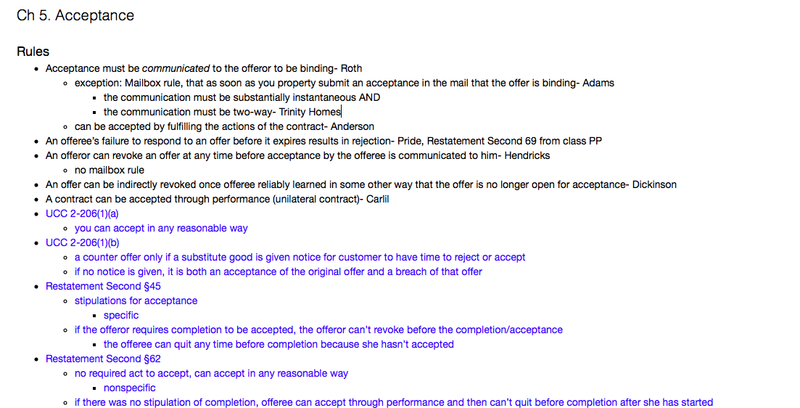 It's just an easy way to keep all the relevant rules and slides and professor tidbits clumped together. This is called a skeletal outline, which is also how I came up with my attack outline that I memorize to help me not miss any points on a final. As for the chapters you can either go in the order that the book has them, or if your professor skipped around then you can go in that order. Just pick whichever order makes the most sense to you. Once you've finished your outline completely (when class is over), go back through to rearrange and edit it to make sure that it makes the most sense to you. Here's some things to keep in mind as your do your outlines. How often to update your outline: I recommend doing it as you finish each chapter once you can get the big picture from your book, class, and notes at first. Once you get the hang of it, you might be able to work on it every other week like I'm trying to do. What to put in an outline: Doctrines or legal theories, definitions, rules, elements/factors to consider, exceptions to the rules, variations on rules (majority/minority), steps or analysis, policy arguments, examples when needed, major cases, flowchart/spider maps/tree diagrams are all great information to help make sure you understand the legal concepts. What not to put in an outline: Full case briefs, trivia from cases, and information not relevant to the course are all just a waste of your time. 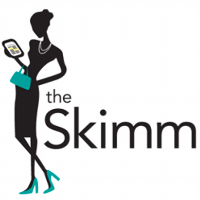 How long to make your outline: Keep the skirt rule in mind, "long enough to cover what needs to be covered, but short enough to keep your attention." Remember that at the end of the year you will be trying to memorize this, so putting unnecessary information in it will just hurt your brain. Mine were generally between 10-15 pages. Again, if you're unsure make sure you make an appointment with your professor around midterm to review your outline. How to know your outline has enough: Simply put, check around. Email your professor (I suggest either the half-semester mark or about a month before your final) and have him/her go over it just to see if you've been too broad or too specific. If you're in a study group, see if y'all can compare and share outlines. Ask your classmates or upperclassmen if they know of any old outlines that you can compare your to. Compare your outline to one you can find online. I found these free outlines that are sorted by subject & book and are what I've used as a reference in making my outlines. Quimbee has these paid outlines. And the company who I did my podcast with also has paid outlines. What I did when using other outlines to make mine was after I was done I would have mine and their side by side and I would see if there was an area where they explained something better than I did or if I completely forgot a concept then I would add just that little bit of extra information to mine. Remember that professional/online outlines will have way more information than you'll need so don't feel like you have to make yours as expansive as theirs! Most of my outlines ended up being between 10-20 pages and that was because sometimes a whole line would just have a few words on it. Don't think that you have to make yours full of complete sentences! Just make sure it has only the information that you need. You have impeccable timing! So glad you posted this today! I am in the midst of starting my first outlines and it was boggling my mind. This is super helpful!